Many of our 55,000 readers are chief executives, trustees and senior managers in charities and voluntary organisations. Others are parliamentarians, lawyers, finance professionals and private sector executives concerned with corporate responsibility. 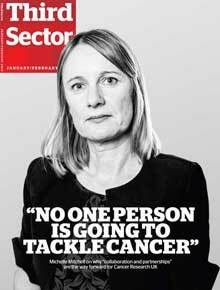 Third Sector offers unrivalled coverage of the whole range of voluntary sector concerns through the printed magazine, the website, and a range of conferences and events. Each day ThirdSector.co.uk provides the latest news, and readers can sign up for free daily email updates. The site also offers subscribers a comprehensive resources section giving case studies and expert advice to help them do their jobs better. Other features include a detailed event listing giving details of the most important conferences, seminars and training sessions in the voluntary sector and a searchable archive of past Third Sector articles. The printed magazine is the UK’s only bi-monthly magazine for decision-makers in charities, the voluntary and community sector. It offers a complete overview of what’s going on and what people are thinking in today’s fast-moving not-for-profit world – the latest news, incisive comment and in-depth features. Our news pages (including fundraising, finance and politics news, news analysis and interviews) cover the latest breaking stories, while the opinion pages provide lively comment and debate. Our features pages provide analysis of topical issues and practical help and advice. The Good Practice section contains practical information about the topics that most matter to charities, including fundraising, finance and management, to help voluntary sector staff to do their jobs better. Third Sector also runs a range of conferences and events, including Fundraising Week, which gives charity staff the opportunity to meet with peers, attend seminars and key note sessions by expert and practitioners and meet with selected suppliers. We also run an annual awards scheme. The Third Sector Awards recognise innovation and outstanding achievement in communications and marketing, fundraising, finance, management, governance and working with other sectors. Third Sector Jobs hosts the widest range of charity jobs, from voluntary to fundraising roles, be it nationwide or overseas, or in specific UK regions. Jobseekers can search for vacancies by function, sector and location, and can filter their search further, for example by job title, salary band and contract type.